"Wooden wallet? Are you messing with me?" - Nope. I have a friend... Let's call him Daquanne to preserve his anonymity. He found out I did woodworking when he saw one of my wooden business card holders. He thought they were stunning and asked me to make him a wooden wallet. Basically one of the business card holders but a little thicker. I must admit I had two thoughts. The first was, "this is the stupidest thing I ever heard of." The second was, "I wonder if the geometry will all word out." I thought that perhaps he'd take a super minimal wallet. More of a money clip to be honest. 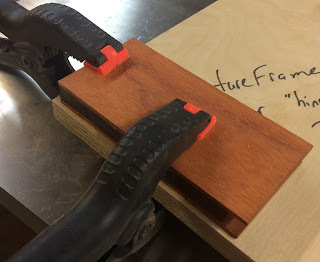 To make a prototype I took a 1/4" thick piece of poplar and using my belt sander I thinned the edges out to give it a fair curve on the back leaving the face flat. I then took some sandpaper I folded down to about 1/2" wide and used it to put a slight recess in the back. 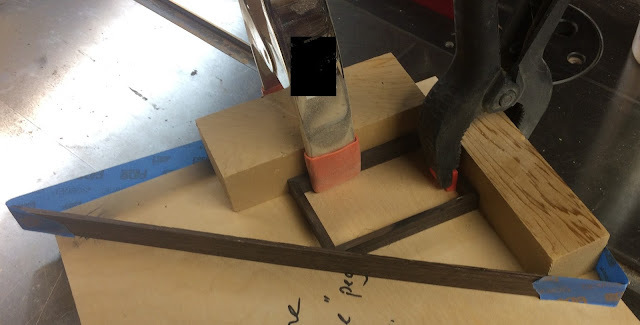 by basically sawing it against the grain. I bought some elastic band and stapled it to the back stretching it around the front. It actually worked quite well for holding a couple of credit cards and a few bills together. Unfortunately I didn't take a picture of it and I cannot find it. If I come across it I'll update this post. More unfortunately Daquanne was quite displeased with it. Let's just say he's lucky I felt like giving it another try. 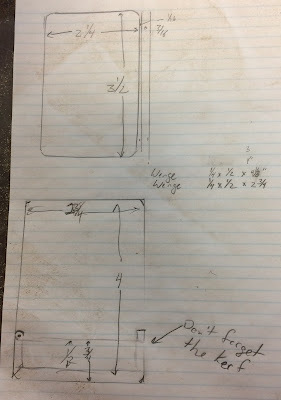 So instead of figuring out if the geometry of a thicker business card holder would work I offered to make a card holder that had the same basic geometry of a zippo lighter but large enough to hold a credit card, some cash and a bus card. 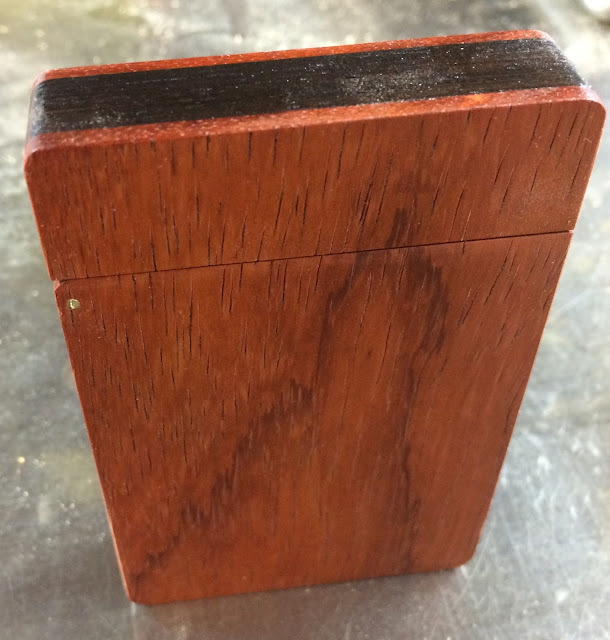 Since I was working with a time constraint I decided to see if I could just throw one together out of some scrap Wenge and Padauk I had lying around. 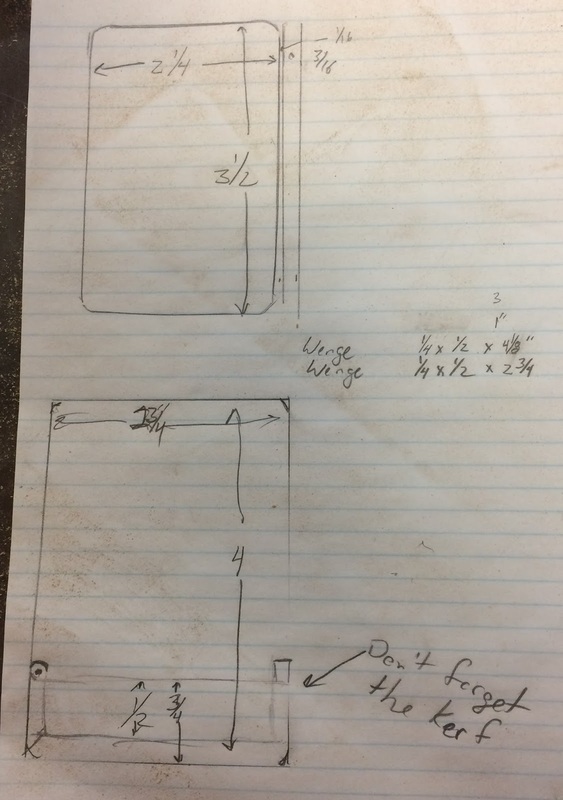 I did take a couple of minutes to sketch out a plan. I started by planing my wenge down to about 3/8" x 1/2". It's not exact but doesn't need to be for this purpose. I then cut it into pieces for the sides, top and bottom mitering the corners. 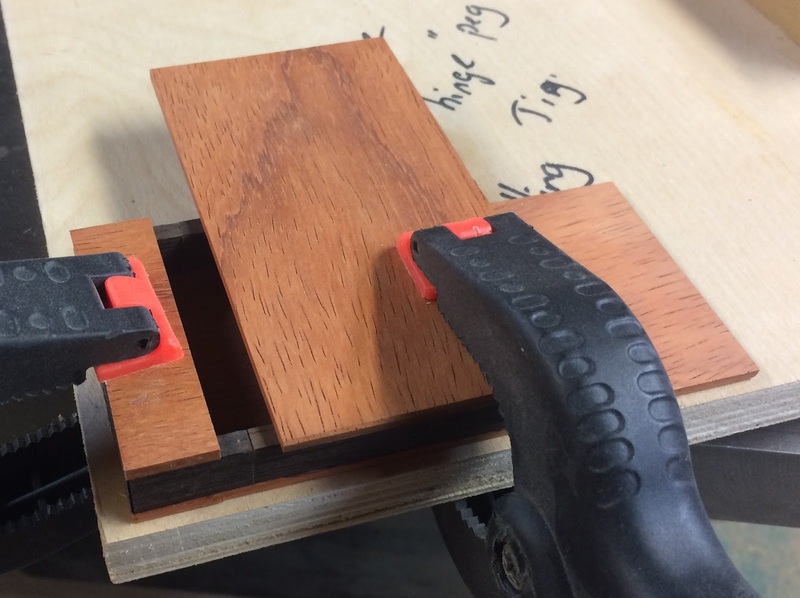 I reporposed and old jig I used for making picture frames and glued up the wallet frame. I cut the long sides about 1/8" longer than I needed so I could use my table saw to separate the top and bottom pieces. I then sized the padauk to width and separated the top pieces and glued them on. Then I fit and glued the bottom pieces on one at a time. You can see in the left picture that the paduak on the top piece doesn't cover all the wenge. 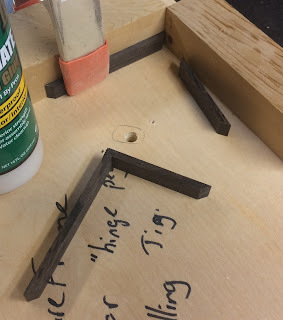 This is because I wanted to use the wenge stubs for my hinge as you'll see in a bit. You can see I also left the paduak a little long. After gluing the front and back on I trimmed off the excess with my bandsaw. 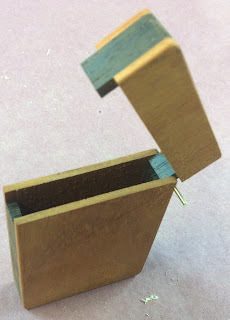 Then I drilled a hole and inserted the hinge pin. 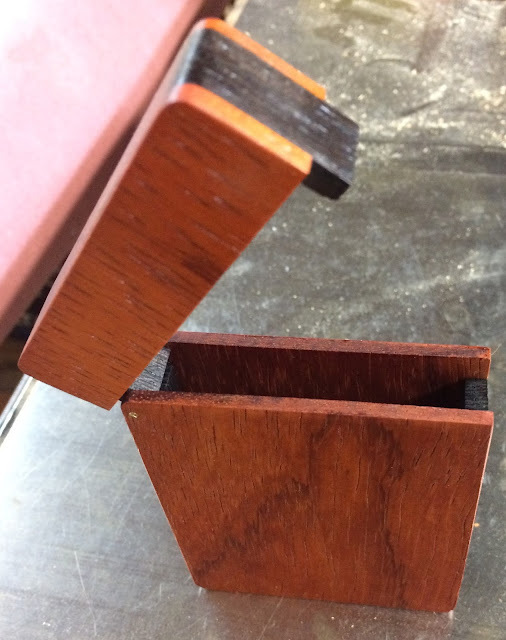 Once the case was being held together I spent some time at my drum sander to make the padauk flush to the wenge and to round the corners slightly. I also softened the edges with some sandpaper. For finish I took the suggestion of my wood monger - I don't know if monger is the correct term but it sounds cool - anyway, Valarie suggested I use shellac to seal the wood before pulling my standard oil and urethane on as the oil would darken the wood and I'd lose some of the bright red color. So I bought a can of spray shellac and hit the outside of the magazine case with that. Then since shallac really isn't an appropriate final finish for something that's going to be carried in a man's pocket all day I put two coats of my standard wipe on oil and urethane finish. I still think a wooden wallet is stupid; however, for something I threw together with minimal planning I think it worked out pretty well. Most important, Daquanne was happy with it too.